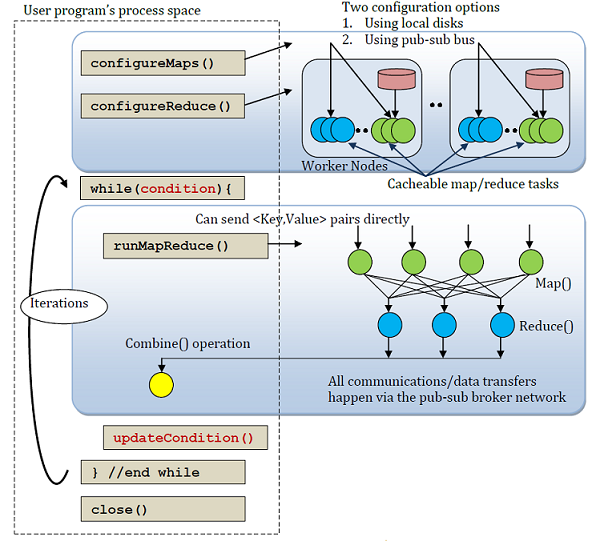 Twister is a MapReduce runtime with an extended programming model that supports iterative MapReduce computations efficiently. It uses a publish/subscribe messaging infrastructure for communication and data transfers, and supports long running MapReduce tasks. In particular, it provides programming extensions to MapReduce with broadcast and scatter type data transfers. The below figure illustrates the runtime architecture of Twister framework. Microsoft has also developed a project that provides an iterative MapReduce runtime for Windows Azure called Daytona.